Captivating and often heart-wrenching, The Beauty of What Remains is a story of liberating a family from secrets, ghosts, and untold pain;of reuniting four generations shattered by shame and fear; and of finding the ineffable beauty of what remains. Where are they now, the lost, the forgotten? With the love in her mother’s silence as her guide, Susan began a quest to find out who the missing people in her family were and what happened to them. The search led her to Germany, where her father was killed just before the end of WWII; then to a Buddhist monastery in France where she learned new ways to relate to life and death; and ultimately to a state mental hospital in Ohio where the family abandoned her mother’s older sister years earlier. She believed that her aunt had died – but Hadler, to her great surprise, found her still alive at age ninety-four. And the story didn’t end there. “If you don’t believe it’s possible to miss someone you never knew, Hadler’s quest-based memoir will convince you otherwise. 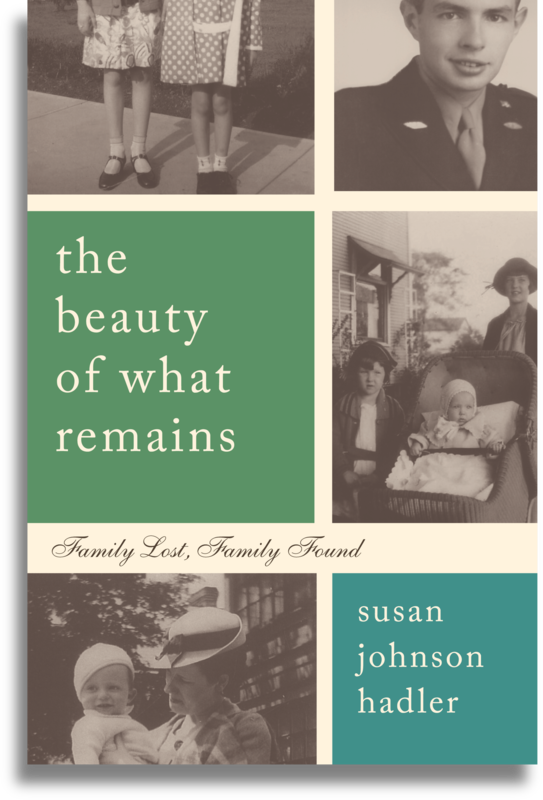 The Beauty of What Remains dovetails the search for her hero father who never came home from war with that of her mysterious aunts. In seeking them, she gradually finds herself, but will keep you pondering the secrets we keep.” Megan Smolenyak, author of Who Do You Think You Are?